Most revivals and spiritual awakenings began with a small group of people praying and fasting. People broken over their sin, who hungered for God to revive, to breathe life into dry bones. And fasting is not easy. I love food. I don’t love being hungry nor the crankiness that often accompanies my growling stomach. But there is something that happens as my stomach growls and I turn my heart and mind toward God in prayer. I begin to ask God that I would hunger for Him more than I hunger for physical food. Oh that I would not be satisfied with anything other than God and His ways. That sin would turn to ash in my mouth and that I would hunger to know God more, to serve Him with excellence, to bring Him glory for He is worthy of all of me. As I my stomach growls I am reminded to pray for those who have no choice, but to fast. Oh, Lord may we, Your Church, care for those in need for we are needy for Your grace. When my crankiness over my empty stomach threatens to spew its venom, I understand why so many in this world are angry and hateful. They are starving for God. Only He can truly satisfy and they don’t even know they need Him. Oh Father may those who do not know You come to know You. Use me and Your Church to bring those starving for You to the table of Your grace and mercy. Sometimes all it takes to desire more of God is to stop filling ourselves with things that do not truly satisfy. 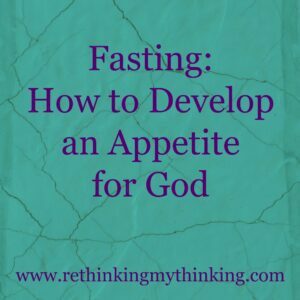 What have you learned when you were fasting?